Sarah Meg shows off the Rubber Tramp Artist Community flag that she made. If you’re headed to the Rubber Tramp Rendezvous (RTR) or the Women’s RTR, you might have heard about the Rubber Tramp Art Community. If you’re wondering what the group is all about or if it’s a group you might want to join, this post will give you information on how it came to be and how you can get involved. 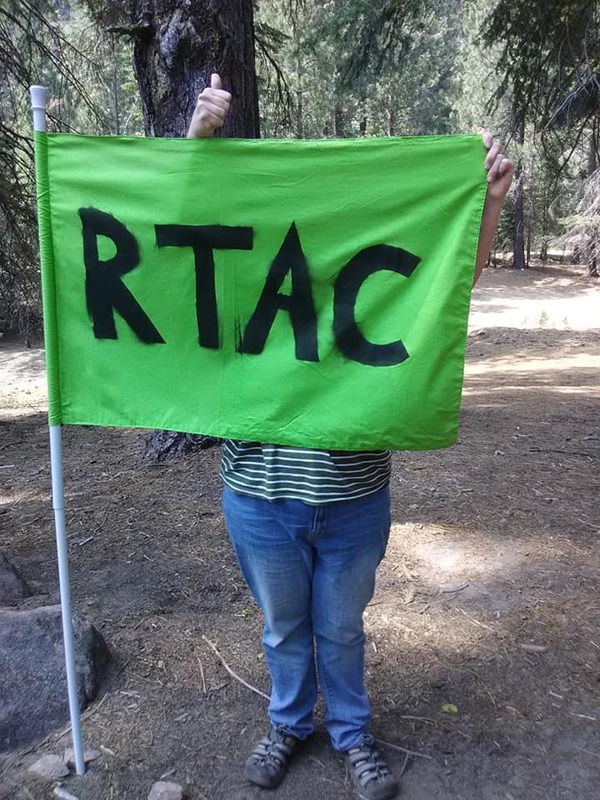 The Rubber Tramp Art Community (aka RTAC) is an intentional community for nomadic artists/creative travelers. We meet up to camp together along the way; creating art together, eating together, teaching each other new skills, helping each other, and just spending time together as a community. The group is open to new members. If you’re on Facebook, joining the Rubber Tramp Art Community there is a good way to start your involvement. You have to ask the join the group, and you will be asked to answer some questions. The intention is that members of the group will actually live nomadically and creatively. This is not just another general group for vandwellers, RVers, or other nomads and vagabonds. If you’re at the RTR, find the Rubber Tramp Art Community and visit with members there. At this time, I don’t know where the group will be camped, but ask around. Word of mouth is a great way to find cool people and groups at the RTR. Over the summer, I had the pleasure of interviewing Sarah Meg, one of the movers and shakers in the Rubber Tramp Art Community. We had a lot of fun talking, and the interview turned out longer than I planned. I decided to run our conversation about the Rubber Tramp Art Community as a separate post at a later date. That later date is today! Rubber Tramp Artist (RTA): You’re one of the founding members of the Rubber Tramp Art Community. Could you tell me what the group is, how it came about, how you got interested? I think it was pretty much your idea, from what I remember. Sarah Meg (SM): It wasn’t really my idea to be honest. All I did was the footwork. The ideas came from the group, and I put in the effort to make it happen. RTA: So could you tell us first what it is? SM: The Rubber Tramp Art Community is an intentional community for creative nomads. We like to say “nomadic artists,” but a lot of people who are very creative and artistic wouldn’t consider themselves artists. If you’re thinking about joining and you’re creative and you’re a nomad, I would love to hear from you [via Facebook] as would anyone else who’s working on membership of the club currently. We started out at the RTR [Rubber Tramp Rendezvous] in 2018. Sue Soaring Sun started the RTArt Camp at the RTR. You were there as well. SM: You’re one of the founding members as well. RTA: I was assisting Sue. Before we got together as a group, I was assisting Sue and then other people came out and contributed as well. SM: It’s actually kind of funny. It took me an hour and 45 minutes to find Art Camp when I was first looking for you guys, so this almost didn’t happen, we almost didn’t have the Rubber Tramp Art Community because I almost gave up [laughter] trying to find you guys. I believe there were nine of us camped [at the RTArt Camp] who were there almost every day, helping and doing artwork together and just having a ton of fun. We had a campfire one night where we burned an incredibly toxic log, got a little loopy, and started talking about how fun it was to have art camp. One of our founding members said, “Wouldn’t it be awesome if we did Art Camp all the time?” I started thinking about it. I thought, “It would be awesome if we did art camp all the time, but how would that work?” Then there was a conversation over the next couple days while we were still at the RTR about how we could make a community out of Art Camp, how could this be a traveling community. Our first idea was that it would be a community that caravanned together and was together all the time. That quickly fell through because herding nomads is like herding cats. I did not want to do that and neither did anyone else. We within two and a half months had broken off the group into smaller groups and then went to events throughout the year. Currently what we’re doing is anyone can host an event. Nobody but me has done it so far, but you guys can. Anyone in the Rubber Tramp Art Community can host an event, and if people show up, yay, if they don’t, then, hey, you had fun in the forest or the desert or the beach by yourself. 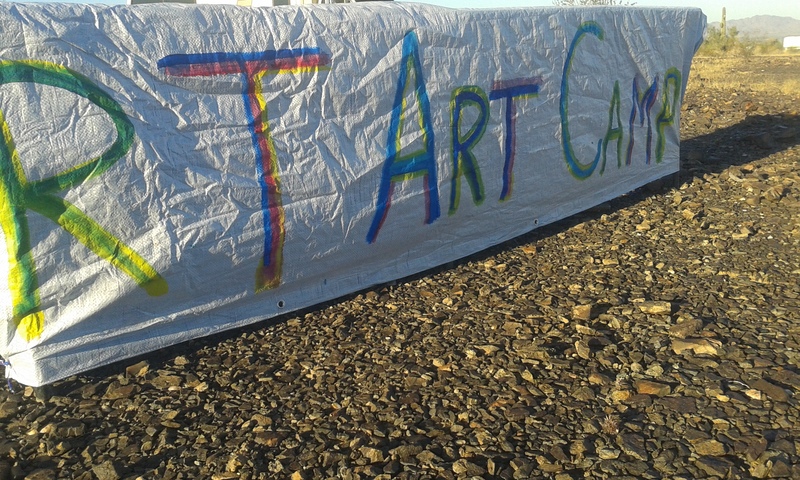 We’ll be hosting Art Camp, of course, at the RTR, and eventually, there’s been quite a bit of talk with other members about eventually making this a nonprofit for various reasons. The first reason was actually brought up in the first month when a part of our group was camping together was that we wanted to have a fund for people [in our group] who were very low income, so we could help people out. If their rig broke down, we could help pay for repairs. We didn’t know how that could work, and then we thought about selling t-shirts to put that money into the fund. So we’re working on, I’m thinking of how we could become a nonprofit. That’s our next stage, although that might take quite a while.